Law at the End of the Day: Just Published: "The Concept of Constitutionalization and the Multi-Corporate Enterprise in the 21st Century: From Body Corporate to Sovereign Enterprise"
Just Published: "The Concept of Constitutionalization and the Multi-Corporate Enterprise in the 21st Century: From Body Corporate to Sovereign Enterprise"
I was happy to report the publication of Multinationals and the Constitutionalization of the World Power System (Jean-Philippe Robé, Antoine Lyon-Caen, and Stéphane Vernac, eds., Routledge (Taylor & Francis Group) 2016) ISBN: 978-1-4724-8292-1 (hbk); ISBN: 978-1-315-596334 (ebk), with a forward by John G. Ruggie. This work is part of the Globalization Law & Policy Series which I edit. (See HERE). 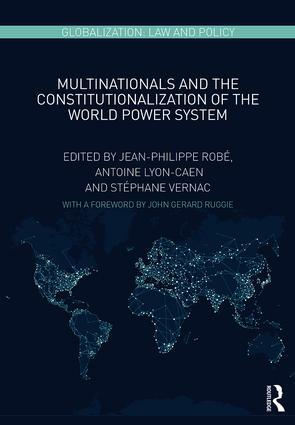 Among the essays published was my own contribution to this excellent conversation-- The Concept of Constitutionalization and the Multi-Corporate Enterprise in the 21st Century: From Body Corporate to Sovereign Enterprise (earlier version here). In this chapter I consider the conception of constitutionalization as a structure for theorizing a space within which constitutionalized entities may interact within the framework that legitimate regulatory agents--the ideological principles of constitutionalism now liberated from its arbitrary confines within the state. I identify the four conventional strands of constitutionalist discourse Constitutionalism provides a framework applicable to any organized group, from States to non-State actors, that seeks to govern itself through an entity autonomous of other entities and of its constituent parts. In globalization, all self-governing groups necessarily interact, as equals or otherwise. There is a need, therefore for a common platform for interaction among bodies corporate, that is for the intermeshing of governance personalities that “bump up” against each other as equals or otherwise. This has an important practical effect, especially in a global order increasingly willingly to privatize lawmaking and governance through multinational enterprises. The abstract and introduction follows. Looking forward to engagement in this evolving area. ABSTRACT: This paper considers the conception of constitutionalization as a structure for theorizing a space within which constitutionalized entities may interact in accordance with the ideological principles of legitimizing constitutionalism. Constitutions have been the means through which states have expressed their organization and ruling ideologies. Constitutionalism provides the normative ideology for expressing the core rules and values that determine the legitimacy of variations in constitutional embodiment. Once associated with the construction of political “persons” the normative structures in constitutionalism have opened the possibility of using its frameworks for the embodiment of any organized group that wants to govern itself. It provides the structure for incarnating an institutional entity that is "ensouled" in the sense that it is separate and autonomous from its creators, though operated through them. In globalization all self governing groups interact beyond the territorial borders of states. That interaction requires a common platform for intermeshing among quite different classes of constitutional entities. Constitutionalization is the way one understands the science of that search for a common communicative platform among self governing groups related by their interactions. But it also suggests an obligation to constitutionalize along its terms — there is an aspect of ministry in constitutionalism that is manifested through its works — what it offers constitutional actors and their constituent members that is deemed “good” as a guide to behavior. Thus the paper considers the concept of constitutionalism as incarnation (constitutional formation), "ensoulment" (constitutionalism and values) and community and ministry (constitutionalization). It is the form of constitutions that now serve as the basis for institutional formation. It is the normative structures of constitutionalism that provides the “soul” of those institutional forms, that serve as the basis of their autonomy from their creators and operators and that guide them between right and wrong. And it is constitutionalization that serves as the foundation for a common language of interaction among an increasingly diverse set of constitutional creatures. The paper thus ends with a brief view toward application — what does all this theory mean for the way states and enterprises ought to act, that is ought to perform their constitutional roles in the world in which they occupy substantial positions of power over individuals, who now appear dwarfed by these institutional giants. Constitutions and constitutionalism have become critical elements of global institutional discourse. The purposes of constitutions are well known. From modest beginnings in the West during Greek and Roman times,2 referencing the organic rules for the construction of the political society of the State,3 they had become the means by which a political com- munity evidences the organization of its political order and the institutional structures that are charged with its operationalization.4 Constitutions are static, at least in the sense that that they provide the framework for government and the instructions for the deployment of group power to be exercised by that government. Constitutions manifest a community – the aggregation of individuals (or other entities) – that have formed a body corporate. It is the product of a formation (corporare) to form a body out of the union of otherwise distinct parts. This incorporation was once understood as virtually completely self-referencing. Its context was essentially internal and once effected was as stable as the nature of the genius (understood in its ancient sense of the spirit attendant at birth, as something innate in itself) of the society that produced it. It’s most important characteristic, then, was to evidence the creation of something tangible and autonomous (e.g. a State or an enterprise) from the union of parts (territory, inhabitants, shareholders, productive capacity). Increasingly, the process of formation acquired a more dynamic and ideological element. The dynamics of that process are bound up in the ideologies of constitutionalism. The purposes of constitutionalism are rather newer. It frames an ideological universe, increasingly influential after 1945 and developed in parallel to the international institutions that arose after the Second World War, that provides a normative structure for validating constitutional instruments as legitimate. Constitutionalism, made manifest through constitutional instruments, might also be understood as theological5 – at least in the sense that it is meant to define a systematic and rational study of truths that exist beyond the will or control of any constitutionally constituted body – be it State, enterprise or religious community. That “beyondness” of constitutionalism is critical because of its arguably theological feature – constitutionalism’s sustained focus on the incarnation of abstraction outside of the natural persons whose coming together produces the body corporate. This also parallels strong currents in Western theology, and the philosophical movements that have sought to construct theological structures without reference to historical divinities. All have recognized the reality of the incarnation of abstraction – animating clay,6 the Logos,7 population8 – and now the multinational enterprise, the subject of this chapter. More important, perhaps, is not the focus on the animation of the abstract, but its ensoulment9 – its infusion with those characteristics and normative values, that fidelity to rules and principles, that themselves also manifest a greater abstraction – Truth, Justice, Fairness and the like. While constitutions can be understood as the means of making communities tangible, constitutionalism gives these concrete abstractions a soul, that spark of greater truth that marks the character of the incarnation and by their acts distinguishes between legitimate and illegitimate operation (“And the Lord God said, “The man has now become like one of us, knowing good and evil)”.10 Constitutionalism, then, provides the normative foundation applied, in context, through constitutions, by States (certainly) and other non-State actors (more recently) that seek to not merely make themselves tangible, but self-governing in ways that are deemed so both by internal stakeholders and external constituents (from the community of nations to transnational consumers and investors). There are a number of significant schools or approaches to constitutionalization.11 One strand can be identified as “global constitutionalism”.12 It has as its object the ordering of the community of political persons, States, within one organized world order. It would attain this objective by aggregating the political authority of States through international superstructures as new global government. It has sometimes an administrative character.13The recent global embrace of judicialization of State and inter-State activities suggests one aspect of this construction. It is built from interlocking State and international judicial and quasi-judicial bodies (ICC, WTO, human rights courts, and so on.) whose pronouncement of outcomes in disputes that come before them build a large well of customary practice that might form a singular legal edifice. Similar efforts have been attempted through global administrative bodies (WTO and standard setting agencies), and less successfully with executive bodies. It is premised on the ideal of a unitary system of constitutionalism which produces all sorts of entities each derived from a “legal” person of higher station. Another important strand may be identified as “transnational constitutionalism”. It seeks to manage the tendency toward nihilism in the anarchy of the Westphalian system14 by positing constraints on the constitutional choices that might be made by any polity. It recognizes a customary and communal ordering of States, whose community is held together through mutual enforcement of a common core of customary principles. This common core of constitutional principle is made flexible through elaboration of complex notions of margins of appreciation exercised by States. The common constitutional traditions of States serve as a focal point of transnational substantive constraints on individual State power.15 It is the most traditional of the modern constitutional ideologies. It is grounded in the idea that constitutions and States form a closed circuit into which non-State actors play no role. It reinforces the primacy of law as a field and as a mechanism for legitimate expressions of political authority closely tied to the State.16 It is premised on rule of law as a political concept that may only be asserted by a sovereign polity defined by the territory its apparatus can control. But it substantially constrains the flexibility of a sovereign polity by the application of supra constitutional principle. A third strand is sometimes identified as “polycentric constitutionalism”.17 It is anarchic (in the sense that there is no normative or institutional power center) and it applies contextually to all institutional aggregation of groups of constitutive entities (States, corporations, religions, non-State organizations) each organized according to the logic of the organization – functional differentiation serves as marker. Although polycentric constitutionalism posits common structures and principles of constituting legitimate communities18 the details of such constituting organization, their character and scope are understood as functions of the consent of the individuals or institutions that have come together to form (constitute) the entity. For political organs, political constitutionalism is the rule. For the rest, non-State actors mostly, principles of societal constitutionalism predominate19 – these suggest the forms of political and legal constitutionalism applied extra-legally. This gives rise to all sorts of formalist fussing about the legitimacy of non–law-based governance, fussing that is grounded on the fundamental ordering prem- ise of political constitutionalism that, under rule-of-law principles, holds legislatively authorized law at the highest level of authority. For some, each governance order exists autonomously and both are horizontally arranged. For others, societal constitutionalism is a polite way of suggesting forms of constitutional delegation to creatures that must be understood as derived from and subordinate to States. 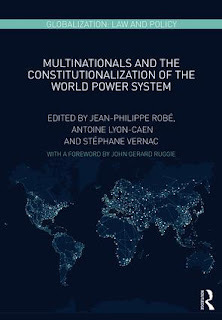 A fourth strand posits a “World Power System” (WPS) as a constitutional system.20 It is one that suggests a malleable notion of constitutionalism, one that stretches its traditional notions, but one that remains loyal to its core values. That controlled malleability suggests the application of traditional though reshaped constitutional notions beyond the nation-state, to enterprises that occupy a de-territorialized space (and are thus in a sense societally constituted, though they do not embrace the notion of societal constitutionalism per se). Yet the possibility of the constitutionalization of (that is, the process of constitutionalizing) the extra- territorial governance space that enterprises increasingly occupy can be enhanced through an instrumental approach grounded in legislation that might contribute to the normative project of fashioning a “good” consolidation of the auto-constitutionalization of the WPS through a variety of micro-devices. This constitutionalizing strand effectively detaches constitution- alism from States and then, so detached, applies them with equal force to all governance institutions – all understood as incarnations of power. Constitutionalization, in contrast to constitutions and constitutionalism, “stands as an expression of a set of processes that are now having an impact on decision making at all levels of government – local, national, regional, international. It concerns the attempt to subject all governmental action within a designated field to the structures, processes, principles and values of a “constitution”21– but it is more than that. Globalization has untethered politics from the State. But it has not unmoored the standards and indicia of legitimacy and institution creation from its State-based origins. By the beginning of the twenty-first century, constitutions and the ideological basis for its legitimate operation, had become the standard for judging the legitimacy of governance organs. As non-State actors increasingly sought to assert governance authority – from those activities once understood as inherently political and administrative, executive or judicial in character – they turned to the forms of legitimacy used by States and embraced constitutions, and with it the normative framework of constitutionalism. Constitutionalization, then, refers to those processes that subject all efforts to incarnate intangible aggregations of governance power in the structures constitutions and the ideology of constitutionalization. The concept of constitutionalization, then, focuses on the drive to apply the insights of constitutionalism to incarnated abstractions, to engage in ministry. Where once it applied almost exclusively to religious and political orders, the early twenty-first century has seen the expansion of the notion to practically every form of institutional aggregation. That movement has changed the world. To grasp the meaning of constitutionalism, to be able to see through constitutions to the abstractions made flesh which in turn themselves build communities among other animated abstractions within national, international and transnational spaces, then, requires a close study of the basic principles of constitutionalism. But such enterprises requires a magisterium, a Sanhedrin, an imam – those who teach the faithful about what is expected of them, who arbitrate the meaning of the normative principles that frame judgment about the legitimacy of action. There are many of those, each vying for recognition as the authoritative voice both to describe the universe within which these abstractions live and operate, and to elaborate the principles through which they may be judged and validated, and may thus exercise their power without opposition. Constitutionalization makes constitutionalism unavoidable – and constitutionalism is now marked by constitution-making in accordance with the normative rule systems of constitutional construction. But beyond these generalities, there are deep theoretical schisms. These schisms are made more interesting as constituting agents increasingly “make theory” from their own actions – and theory is then put in the embarrassing position of having to catch up to facts on the ground. That certainly has been the story of the march of constitutionalization for non-State actors, especially multinational enterprises. This chapter considers this concept of constitutionalization in the context of the multinational enterprise. The baseline for that consideration is the WPS approach – the notion that the global project of constitutionalization is as yet incomplete – and requires for its completion the absorption of non-State actors, and principally the large transnational economic enterprises that have become sometimes more powerful political actors than many States. The framework for that consideration is the framework of constitutionalism itself – the drive to find structures for the incarnation of abstractions whose force can be readily felt but which can be felt only in the effects it produces. But just as constitutionalism is not solely about form – the self-referencing self-constituted entity – so the analysis also looks to the function of this structuring, the ensoulment of the enterprise. That ensoulment is represented by the normative premises (or deep structures) of constitutionalism, those rules that constrain the intangible person in its constitution and operation. Yet it is the malleability of that soul, and the identity of those who may speak for it, that provides as difficult a set of issues for non- State bodies corporate as they do for States. Constitutionalization, and its theoretical structures, if only considered as an amalgam of the desire or intent (understood as a cultural instruction or preference) to invoke the frameworks of constitutionalism for the formation and interactions of bodies corporate merely provides only a static view of the revolution in the rearrangement and control of governance authority. But constitutionalization serves, or ought to serve, a deeper purpose, and one that serves as the underlying thesis of this chapter: Constitutionalism provides a framework applicable to any organized group, from States to non-State actors, that seeks to govern itself through an entity autonomous of other entities and of its constituent parts. In globalization, all self-governing groups necessarily interact, as equals or otherwise. There is a need, therefore for a common platform for interaction among bodies corporate, that is for the intermeshing of governance personalities that “bump up” against each other as equals or otherwise. Constitutionalization is the way that we organize the study of the search for (and theory of) a common platform among self-governing groups which are related by their interactions but which need a system for identifying each other and organizing those interactions. It serves as the meta-structure for the space within which the community of believers may interact within a shared ideological space, one that is both compelling and mandatory. It pos- its meta-principles for constitutionalism that ought to make it possible for States to engage with commercial enterprises and universal religious bodies. But it also suggests an obligation to constitutionalize along its terms – there is an aspect of ministry in constitutionalism that is manifested through its works – what it offers constitutional actors and their constituent members that is deemed “good” as a guide to behavior. The chapter thus ends with a brief view toward application – what does all this theory mean for the way States and enterprises ought to act, that is ought to perform their constitutional roles in the world in which they occupy substantial positions of power over individuals, who now appear dwarfed by these institutional giants. It is the constitutionalist system that in its operation is most compatible with the expectations and customs of stakeholders that will succeed, in the end, as setting the parameters of constitutionalism going forward. 5 Cf. Carl Schmitt, Political Theology: Four Chapters on the Concept of Sovereignty (George Schwab, trans. ), Chicago: University of Chicago Press (2006) (originally Politische Theologie: Vier Kapitel zur Lehre von der Souveränität (2nd edition), Munich (1934) (e.g., asserting that concepts of modern political thought may be understood as theology and theological premises that have been secularized), nicely discussed in David Bates, “Political Theology and the Nazi State: Carl Schmitt’s Concept of the Institution”, Modern Intellectual History, 3(3), pp. 415–442 (2006). 8 Foucault, Michel. Security, Territory, Population, Lectures at the Collège de France 1977–1978 (Graham Burchell, trans. ), New York: Picador Palgrave Macmillan (2007). 9 The concept of hominization is difficult today to separate from the obsession in the West about abortion – a site chosen for the ongoing war for dominance in moral governance between the institutions of the State and those of religion. See e.g. John Finnis, Aquinas: Moral. Political and Legal Theory, Oxford: Oxford University Press (1998). Yet the notion of hominization continues to resonate in its more classical meanings, the core of which was to distinguish inanimate organics (the biblical “clay”) from the sentient, autonomous and self-conscious and self-referencing “person” around whom society grows and governance is built. It is that ensoulment that incarnates God in human and thus provides the claim to superiority and dominance, as well as the basis for distinguishing the good (legitimate). Cf., Center for Bioethics and Culture, Ensoulment and the Sacredness of Human Life (2006): www.cbc-network.org/2006/11/ensoulment-and-the-sacredness-of-human-life/. As such, ensoulment can be understood as much as a political subject in religion as it is a theological subject in politics. 11 It is worth taking seriously Roger Cottrell’s argument, made in the context of the direction of socio/legal theory, that law is a composite of competing and unstable authority claims. Roger Cottrell, “Spectres of Transnationalism: Changing Terrains of Sociology of Law”, Journal of Law and Society, 36(4), pp. 481–500 (2009). 12 See Anne Peters, “The Merits of Global Constitutionalism”, Indiana Journal of Global Legal Studies, 16(2), pp. 397–411 (2009). 13 See e.g., Daniel C. Esty, “Good Governance at the Supranational Scale: Globalizing Administrative Law”, Yale Law Journal, 115, p. 1490 (2006); Richard B. Stewart & Michelle Ratton, “Sanchez Badin, The World Trade Organization: Multiple Dimensions of Global Administrative Law”, I CON, 9(3), pp. 556–586 (2011). 14 Recall the basis of the Westphalian system, which posits States at the apex of political hierarchy, which engage internally as they see fit but with each other on the basis of principles of non-interference in internal affairs of other States, and the legal equality of States. See, generally, Kurt Burch, “Changing the Rules: Reconceiving Change in the Westphalian System”, International Studies Review, 2(2), pp. 181–210 (Summer 2000) and citations therein. 15 Larry Catá Backer, “God(s) Over Constitutions: International and Religious Transnational Constitutionalism in the 21st Century”, Mississippi College Law Review, 27, pp. 11–65 (2008). Cf. Ernest A. Young, “The Trouble with Global Constitutionalism”, Texas Journal of International Law, 38, p. 527 (2003). 16 That connection is nicely summarized in Roger Cottrell, “Spectres of Transnationalism: Changing Terrains of Sociology of Law”, Journal of Law and Society, 36(4), pp. 481–500 (2009). First, it makes the State and its agencies central. Second, it sees law as monistic, not pluralistic, in form (with international law as an extension of the reach of nation-state legal authority through treaties and the recognition of shared customs). Third, it assumes law’s autonomy. Fourth, it almost always assumes settled internal/external distinctions that define the legal field. And fifth, it assumes that State law makes a practical difference; it has general effects in society of such significance that this law cannot safely be ignored in social practice. Ibid., 483. 17 Larry Catá Backer, “A Conversation About Polycentricity in Governance Systems Beyond the state”, Law at the End of the Day (November 11, 2013): http://lcbackerblog.blogspot.com/2013/11/a-conversation-about- polycentricity-in.html; Larry Catá Backer, “Transnational Corporations’ Outward Expression of Inward Self- Constitution: The Enforcement of Human Rights by Apple, Inc”., Indiana Journal of Global Legal Studies, 20(2), pp. 805–879 (2013). 18 Cf. Poul Kjear, “The Constitutionalism of Intra- and Trans-Normative Orders”, Indiana Journal of Global Legal Studies, 20, pp. 777–804 (2013); Jayne Ellis, “Constitutionalization of Non-Governmental Certification Pro- grams”, Indiana Journal Global Legal Studies, 20, pp. 1035–1059 (2013). 19 Discussed in Gunther Teubner, Constitutional Fragments: Societal Constitutionalism in the Globalization, Oxford: Oxford University Press (2012). 20 See Jean-Philippe Robé (in collaboration with Antoine Lyon-Caen and Stéphane Vernac), “Enterprises and the Constitutionalization of the World Power System” (2013 paper on file with author); also see Jean-Philippe Robé, L’Enterprise et le Droit, Paris: Presses Universitaires de France (1999); Jean-Philippe Robé, “Enterprises and the Constitution of the World Economy”, International Corporate Law, 2, pp. 45–64 (2003); Jean-Philippe Robé, “Conflicting Sovereignties in the World Wide Web of Contracts – Property Rights and the Globalization of the Power System”, in Soziologische Jurisprudenz, Festschrift für Gunther Teubner, Gralf-Peter Calliess, Andreas Fischer Lescano, Dan Wielsch & Peer Zumbansen (eds. ), Berlin: De Gruyter Recht (2009), pp. 691– 703; Antoine Lyon-Caen, “Le Pouvoir entre droit du travail et droit des sociétés”, Revue de Droit du Travail, 9, pp. 494-498 (2010).